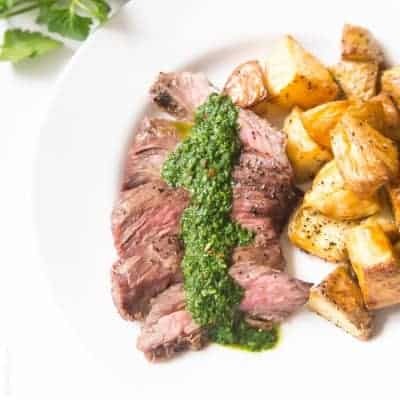 Paleo + Whole30 Tri Tip with Orange Parsley Sauce Recipe – grilled tri tip topped with a bright and citrusy sauce. A 30 minute steak dinner. Gluten free, grain free, dairy free, sugar free, soy free, clean eating, real food. I’ve been sharing so many chicken dinner recipes lately, it’s about time I share another mouthwatering beef dinner recipe with you. 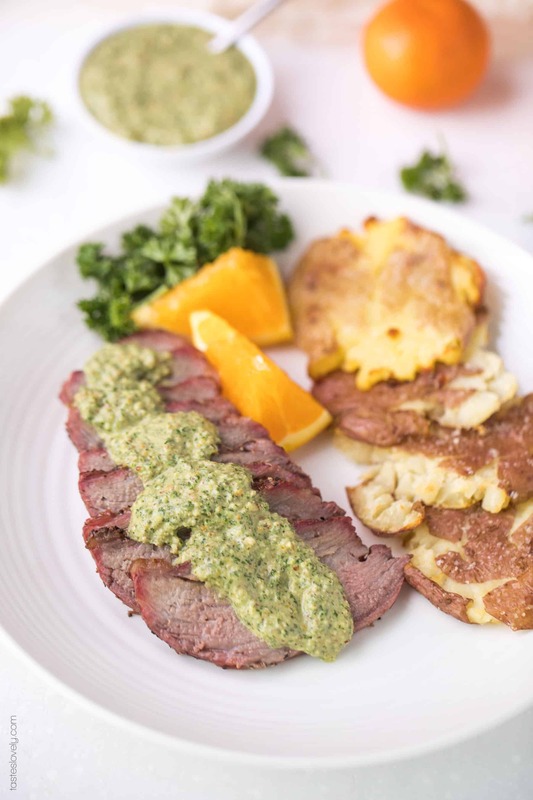 This paleo + whole30 tri tip with orange parsley sauce has been a huge hit at my house. I can’t wait for you to make it for your family to enjoy too! A ton of you have already shared with my how much you’re loving the paleo + whole30 orange parsley sauce I shared last week. 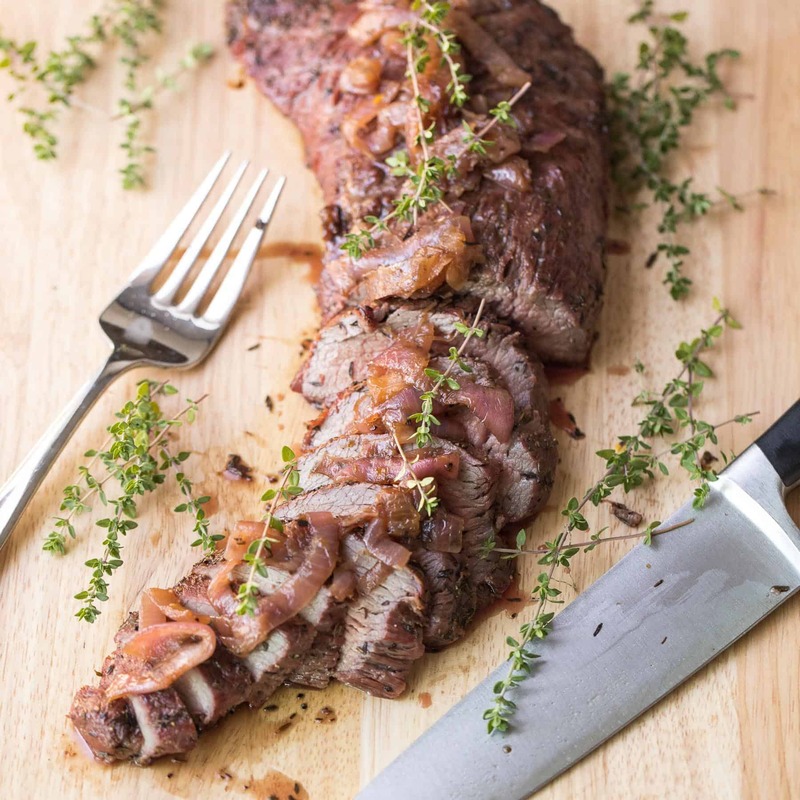 This is one of my favorite ways to use it, on top of juicy grilled tri tip. 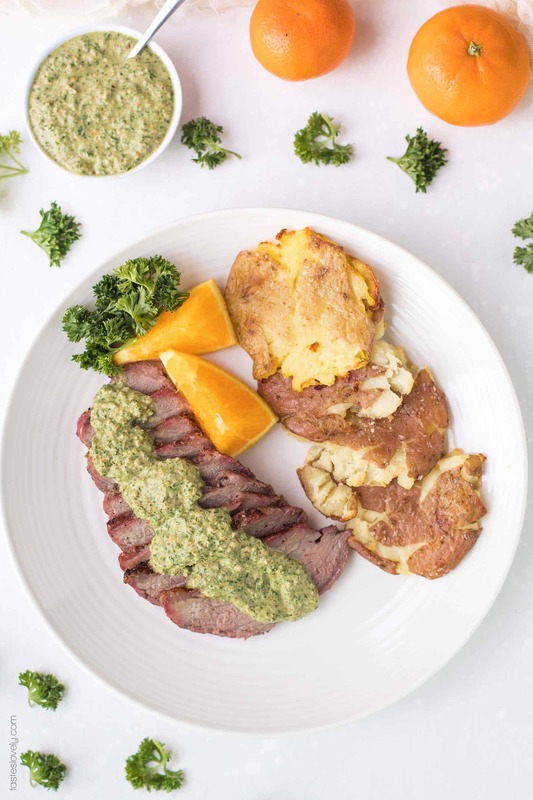 The combination of the salty and umami grilled tri tip topped with the citrusy, nutty and bright orange parsley sauce is such a winning flavor combination. It doesn’t get much better. I’ve shared my other favorite way to enjoy tri tip with my paleo + whole30 marinated tri tip recipe. We make that a TON! I just love grilling tri tip to satisfy my red meat cravings. 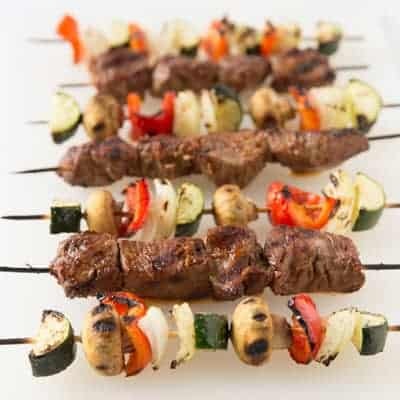 It’s a fairly inexpensive cut of meat that really delivers on beef flavor. I can feed all of us a steak dinner for less than $10-15. 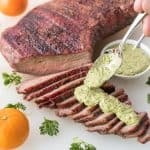 It’s been fun to mix it up and have another great tri tip variation to enjoy with this paleo + whole30 tri tip with orange parsley sauce. Of course I love serving this tri tip with my paleo + whole30 crispy smashed potatoes. 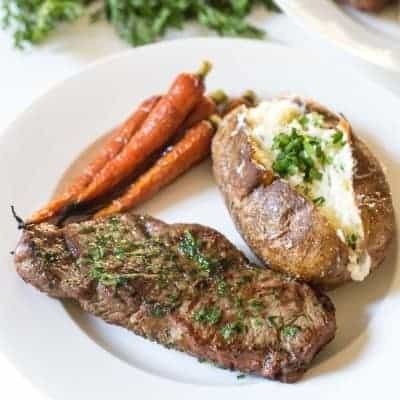 What’s better than steak and potatoes? Nothing! 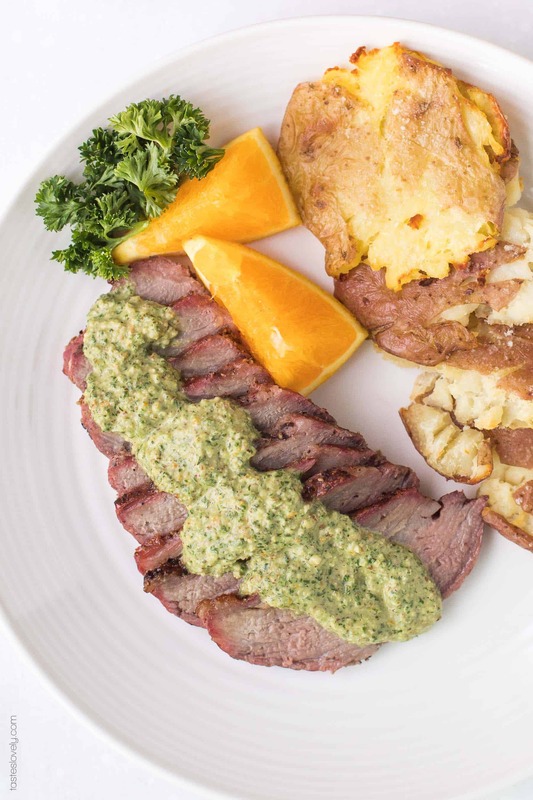 Not only is this tri tip delicious, but so healthy! Paleo, whole30, gluten free, grain free, dairy free, sugar free, soy free, clean eating, real food. Preheat your grill over medium high heat. Clean grill grates and rub with olive oil. Pat the tri tip dry with a paper towel, and season with salt and pepper. Grill the tri tip covered for 10 minutes. Flip and continue to cook until the tri tip has an internal temperature of 135ºF for medium rare (or 145ºF for medium), about 8-10 more minutes depending on the thickness of your tri tip. Remove from the heat and allow to rest for 10 minutes. 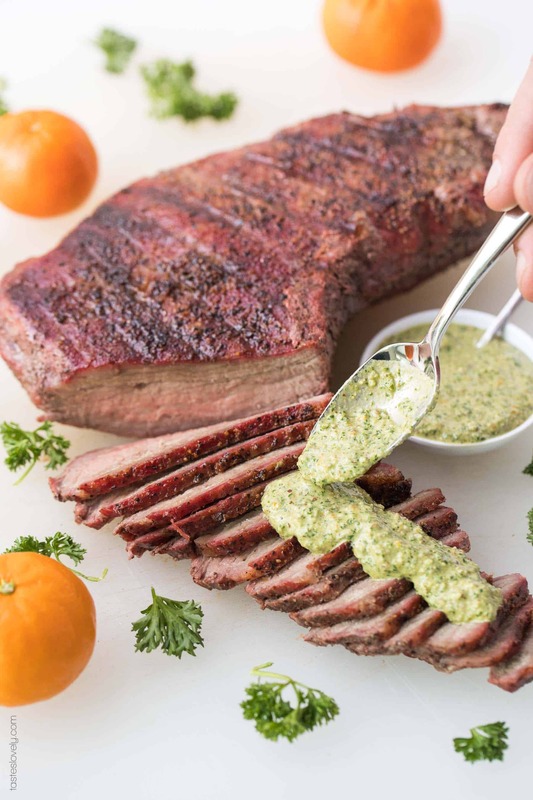 Slice the tri tip against the grain, and serve topped with the orange parsley sauce. I love these with served with my smashed potatoes!